Don’t let mould live where you do – it reduces indoor air quality. To colonize and grow, mould spores need a moist landing pad, a suitable temperature and a food source. Any organic material can serve as the food source, including drywall, wood, fabrics, or any soiled surface. 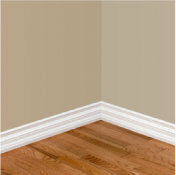 For walls and ceilings, depending on the amount of area you are treating with Concrobium Mould Control, you can apply the solution by: spray bottle (small targeted areas); brush or roller (trim); pump sprayer (large, accessible areas like walls) or a cold fogger (large or enclosed areas like basement, closets). With any option of application, ensure that a thin layer of Concrobium Mould Control is applied to the mouldy surface. Allow it to dry and then clean with a Concrobium dampened cloth or brush. For tough and embedded mould staining, try our Concrobium Mould Stain Eraser. Re-apply the product after cleaning to leave a thin layer of the solution on the surface to protect against future mould. Using a fogger can help apply Concrobium to hard to reach parts of the wall and ceiling. For more details about fogging click here. If there is a concern that there is major mould growing behind your walls, click here for a solution. Suffering in a room that smells musty and mouldy? 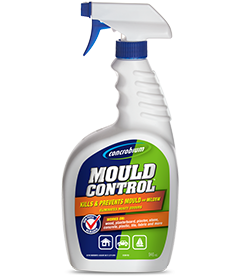 Try fogging Concrobium Mould Control – it’s easy to do and will eliminate mould and musty odours.